Miami point guard Norris Cole, the only current Heat player sure to be under contract with Miami next season, has been improving all parts of his game this season. 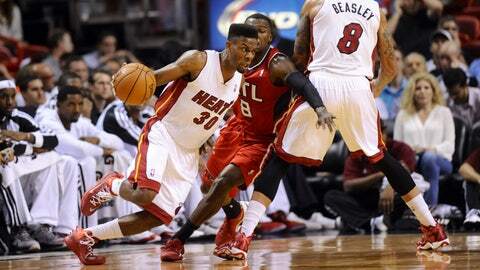 MIAMI — Norris Cole learned quickly that life in the NBA would be different than his time at Cleveland State. "For four years, anytime I exploded to the basket I was getting there with nobody contesting it — so that’s a hard habit to break," Cole told FOX Sports Florida. "My first year was tough. Last year, I had some times of success, then some times reverting back. "This year, I’ve been a lot more consistent knowing when I should get to the rim and make a play and knowing when I can attack, draw and kick." Cole spoke following the Miami Heat’s victory against New Orleans on Tuesday night, when he started for the third time this season. Regular starter Mario Chalmers didn’t play after sitting for the second half of Sunday’s win over Toronto due to Achilles’ tendon soreness. The game against New Orleans offered, perhaps, a glimpse into the future. Chalmers, 27, is set to become a free agent after this season. His financial demands might be more than the Heat want to spend. Cole, 25, is the only current Heat player sure to be under contract with Miami next season. 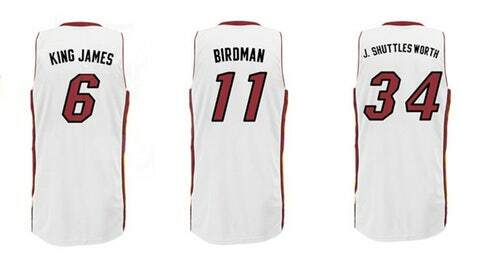 The Miami Heat unveiled the "Name Collection" jerseys that will display player nicknames on the back rather than last names. For now, the 6-foot-2 Cole is focused on improving his all-around game. "I’m working on just being consistent," he said. "I work out all the time, I put in extra work, it’s just a matter of getting out there on the court and becoming more comfortable with it. "My game and my skills have progressed and you can see the more I get to play, the better I play." Cole always has played at a fast pace. He has been working on making better decisions in transition and after driving to the lane. Forward Michael Beasley, who often sees time with Norris on Miami’s second unit, has noticed the strides made by his teammate. "I think the thing he’s most improved on is his court vision and his point-guard awareness," Beasley told FOX Sports Florida. "I’ve been watching him since he’s been in the NBA and I think this year, he’s starting to see the floor as a chess board as opposed to just playing basketball. He’s starting to see things before they happen and it’s making him a better point guard on both sides of the floor." The statistics also indicate Cole continues to get better. The third-year pro is averaging 7.2 points and 3.1 assists in 24.5 minutes — all higher than his first two seasons. He’s shooting 46.7 percent overall, up from 42.1 last year and 39.3 as a rookie. He’s also proven to be a 3-point threat, shooting 42.4 percent; that’s an improvement over the past two years (27.6 and 35.7). Selected by Chicago 28th overall in the 2011 NBA Draft before landing in Miami on draft night, Cole idolized a Bulls star as a young point guard growing up in Dayton, Ohio. "I liked Michael Jordan growing up, but obviously I wasn’t going to be 6-6, nobody in my family is," Cole said. "My dad loved Isiah Thomas and he made me watch Isiah. I watched a little bit of Allen Iverson, Tony Parker, Steve Nash. "I play at a little faster pace than Nash but the thing I get from him is the way he was always aware of where his guys are and how he plays at a high percentage — he has a high assist-to-turnover ratio, he shoots 50 percent from the field, 90 from the free-throw line and 40 from 3-point range." Asked which player’s game most closely resembles his, Cole said Parker. "He’s fast, quick, shifty, get to the paint," Cole said. "But it’s hard for me to pick somebody because I’m fast and shifty but I could always shoot. That’s made it hard to model my game after one person." Beasley has noticed something else about Cole. "His competitiveness more than anything," Beasley said. "He’s not going to like me saying this, but he’s not the biggest guy on the court a lot of the time, but you can never tell. He never backs down from anybody. He’s always aggressive, no matter who’s under the basket." Although Cole said his mindset remains the same whether he starts or comes off the bench, one thing remains constant. "I love to play," he said. "I’m young, so I can play the whole game if they want me to."